INEX green philosophy goes beyond the use of recycled materials or sources of electricity used in the manufacturing process. We work towards a set of long-term processes that generate a greater reduction in environmental impact. From the replacement of our packaging elements and the reduction in the use of inks and large graphics, to changing our marketing materials, INEX’s commitment to the conservation of natural resources is strengthening every day. The real challenge is to manufacture quality products with superior durability to reduce waste generation and promote the intelligent use of water, all this without sacrificing aesthetics and user comfort or increase production costs. At INEX, we strongly believe in what we do and we hope that our contribution helps support a comfortable present and a better future for our planet. INEX guarantee is limited to the replacement of the defective part , not to exceed the purchase price of the item. Labor, shipping and installation charges of any kind are not covered by our guarantee. 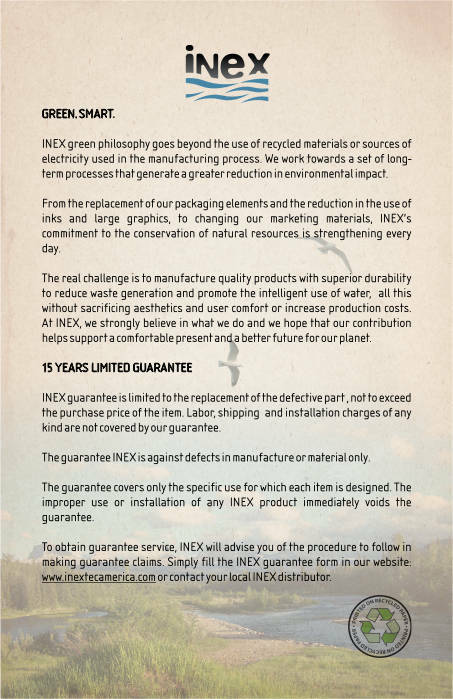 The guarantee INEX is against defects in manufacture or material only. The guarantee covers only the specific use for which each item is designed. The improper use or installation of any INEX product immediately voids the guarantee. To obtain guarantee service, INEX will advise you of the procedure to follow in making guarantee claims. Simply fill the INEX guarantee form in our contact section, or ask to our local INEX distributor. DISCOVER THE NEW GENERATION OF INEX 2016 – CLICK HERE OR VISIT YOUR INEX LOCAL DISTRIBUTOR TODAY!